The question of how to reface kitchen cabinets cannot be answered in one article. I mean there are so many facets to this undertaking such that it requires a large book filled with pictures and tutorials to walk you through. That said, do read this review right through to the end as it will prove quite useful for a start. I know that for sure. The first thing that influences the project is the age of the cabinets. This has a direct influence on their usability. Also age determines the manner in which you can go about stripping off the paint. For example older cabinets tend to have paint with lead, which is dangerous to humans. This means scrapping with sand paper may be dangerous. Next you need to determine the material to use. Some available options include, oak, maple and cherry to name a few. You can then covert the face frames with wood veneer that matches the doors or plastic laminates. You can then make birch or maples raised panel doors and then stain everything with a similar honey color that is light. One thing about Birch is that many people do not use it because it tends to warp after cutting. If you must use it then just consider painting the birch frames with a Windsor Greenland then go with honey cherry raised panel doors. Alternatively just go with a clear soft maple. Try the Northern white soft maple. But if you want something clearer then go with hard maple. I love the way the hard maple looks after it is stained and finished. Consider using the heat sensitive glue for the shelf edges. It really holds up well for longer. Also use 1/4″ thick hardwood for the shelf edges and cabinets. The truth it, all this can be such a hard task. It needs patience, time and a bit of experience. 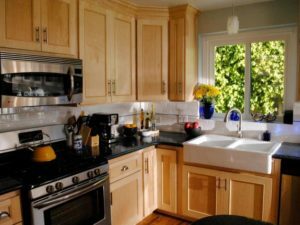 This is why I personally recommend that you find a kitchen cabinet refacing company that offers an obligation FREE consultation that can do all the hard work for you. After all you don’t want to have the veneering lifting in just 3 months or having the cabinet edges getting dinged and damaged sooner that you can afford another reface. There are a number of kitchen cabinet refacing companies in your area. You can find one that can come for an obligation FREE consultation at: Quality Kitchen Doors Nottingham. To know more information about replacement kitchen cupboards give us a call 0115 736 5994 or email us info@qualitykitchendoorsnottingham.co.uk and also visit our website at http://www.qualitykitchendoorsnottingham.co.uk/.